Globalization is changing the way the world works, and employers are increasingly looking for workers who have solid international skills. MyWorldAbroad is a trusted resource, used by many leading universities in the US and Canada to encourage students to go abroad, build international skills and prepare for work in the new global economy. The site helps students and young professionals develop global career skills and find international work, both at home and abroad. With 300+ expert articles and 4,000+ resources, this site covers all the bases: from cross-cultural skill-building and go abroad basics to the international job hunt and popular international professions. The International Quizzes help students measure and track their skills and potential. Stories From Abroad promote peer-to-peer learning with over 85 in-depth student interviews. The MyWorldBlog and a variety of social media feeds provide extra advice and even more opportunities for students to connect directly with students. Other engaging features include: Our popular Quick Guides, Global Nudge social media campaigns, Global Nudge postcards, "In A Rush" articles, sample application documents, self-evaluations, Top Tips & Student Quotes, FAQs, Worldly Wisdom, marketing campaigns, marketing products, staff training webinars, alumni access, and usage statistics. This is the best way to evaluate how MyWorldAbroad can help your students prepare for work in a global economy. Register here for one of our Wednesday webinars, or contact us (richard@myworldabroad.com) to schedule a private session. Our business model: Universities purchase an annual site license, which allows students, staff and alumni access MyWorldAbroad’s collection of articles, resources and tools. The license is purchased by a university (often the career center and/or the international office) or an individual department (e.g. the business faculty). Pricing is based on school size and is both affordable and cost-effective. (We also welcome inquiries from NGOs, volunteer/intern placement agencies, firms and government departments.) Contact us for details. MyWorldAbroad is one of the only full-service sites that helps schools integrate the career component into students’ go abroad experience. We empower students and young professionals to build global career skills. The underlying philosophy of the site revolves around encouraging students to build their international skills step-by-step, over time. By developing a broad range of international skills and experiences consistently over the course of their studies, students not only discover the personal satisfaction of cross-cultural encounters, they also build strong professional profiles and prepare themselves for successful internationally-oriented careers. MyWorldAbroad successfully helps students build global competence! The MyWorldAbroad site is built on two main components: articles and resources. 300+ Expert Articles: Our 300+ articles contain expert advice focused on practical strategies for international success – from overcoming the hurdles of culture shock to maximizing the career value of a volunteer term, we have it all. Articles are constantly being reviewed, updated and added to the site. Articles are written by Jean-Marc Hachey (publisher and founder of MyWorldAbroad) or by senior editors who consult with experts in the field. View sample article. 4,000+ Valuable Resources: Each year, MyWorldAbroad researchers update and review all 4,000 of our profiled resources. These resources include descriptions of international employers, job boards, placement agencies, key NGOs, internship/volunteer opportunities and much more. Our focus is on helping students with varying objectives find the information they need on every conceivable aspect of going international. Resources are organized into 50 lists, offering an extensive array of filtering options. View sample resource. View sample resource list. International Skills: Six sub-sections outline the unique skills that define truly “international” people, and are highly sought-after by international recruiters. Getting Experience: Nine sub-sections outline the numerous potential avenues students can take to begin building cross-cultural experience. Finding Work: Ten sub-sections help define how an international job search differs from a domestic one. This is a universal approach to international job-hunting, applicable to all types of international jobs and with a focus on cross-cultural skills. The Professions: 11 sub-sections describe the nuances of the most popular internationally-oriented professions. Students learn about the job potential and recruitment processes of key internationally-oriented industries, and access resources listing major international players by sector. International Quizzes: Our quizzes are fun and quick. These popular quizzes can be used to measure student progress, identify knowledge gaps, and promote discussion. To measure progress, have students complete quizzes and record their scores before and after going abroad. Seven quizzes help students audit and track their international potential in three different areas: international IQ (view), international experience (view) and preparedness for the international job search (view). Individual scores are rolled-up to a master scorecard (view). Use our printable score cards (Word file, PDF file or Student Excel file) to track progress both BEFORE and AFTER students go abroad. The Excel file is particularly useful for schools tracking groups of students in a workshop, or students taking part in a group visit abroad. Quick Access Menus: What do you want to do? (view) and Top Resources (view) help students and advisors access the most essential advice and resources quickly. Numerous additional design elements create a hierarchy of information, making site navigation simple. See our latest navigation innovation Jump to Content (view sample). Right-Hand Sidebar: This feature is located on the right side of all articles and other key pages (such as this one). The right-hand sidebar is an easy way for students to access content quickly and easily. This is our internal advertising system, allowing us to feature and recommend components of MyWorldAbroad that should not be missed. 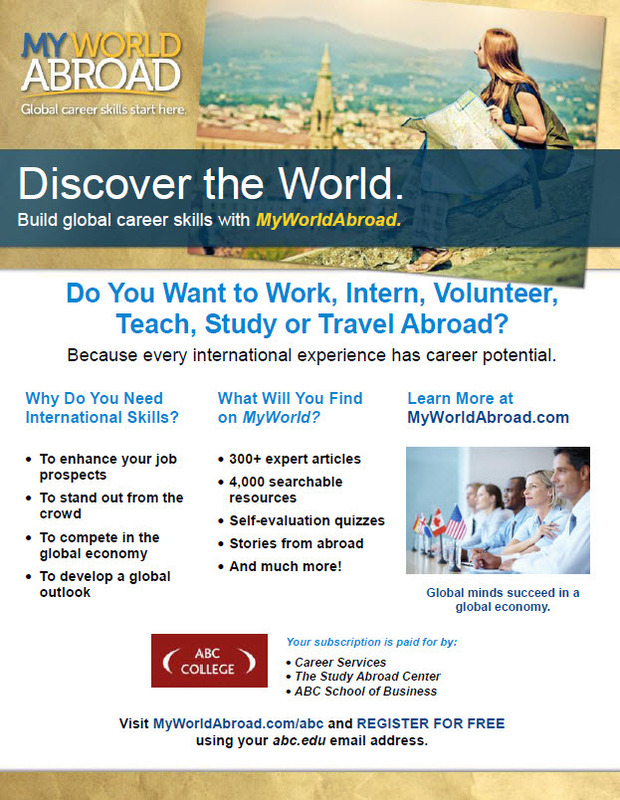 MyWorldAbroad’s content is equally relevant to undergrads, graduates and young professionals. Our writing style is designed to empower users with crucial information, while remaining accessible and motivational. The advice offered in the guide has an innovative and entrepreneurial angle, while being easy to implement. In every section and sub-section, we incorporate a career-building angle, ensuring that readers know how to maximize the professional potential of every international experience at home and abroad, and we focus on encouraging readers to step outside their comfort zones in order to build valuable skills. MyWorldAbroad has been nothing short of essential for my research. It has incredible resources about government, travelling as a woman, and even immunization vaccines. This Website has really helped ease my anxiety, offering enough information to alleviate my concerns before and during my time away. I’ve found the tips and quotes from other students who've been abroad especially helpful. With this information, I feel more at ease and mentally prepared. I look forward to using the site more and more while I’m abroad and once I get home. After reading the inspiring abroad experience stories of other students on MyWorldAbroad.com, I was filled with conviction to pursue an experience of my own. This resource was useful in that it motivated me to develop a concrete plan of where I was going to go, what I was going to do and set my plans into motion. I have made use of the website, and there are some great tips. It's the best place to go for every kind of international opportunity, whereas other sites are tailored to one type (ie just working abroad, just studying abroad). MyWorldAbroad supports schools’ internationalization efforts with practical advice, tools and resources. Subscribing to the guide also encourages communication and cooperation between college/university departments such as Career Services, Study Abroad and International Student Services. The site is a valuable resource for Career Services offices and student advisors. Many Career Services offices have dedicated staff, but some may not have extensive international experience to draw upon when advising. 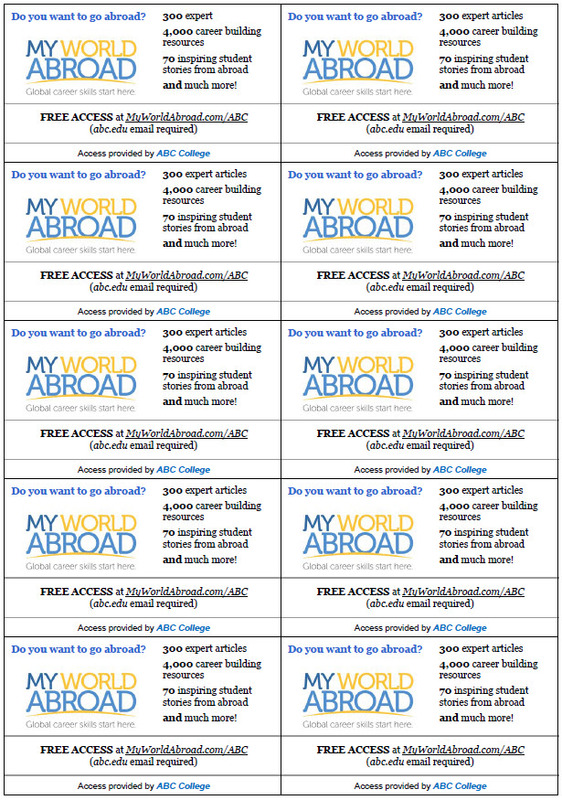 MyWorldAbroad is a perfect tool for strengthening and broadening your advising capabilities. The site empowers Study Abroad and International Student offices to forge links between their programs and the career aspirations of their students. The guide highlights the “career value” of going abroad in a way that school administrators, student advisors, students and even their parents can connect to. 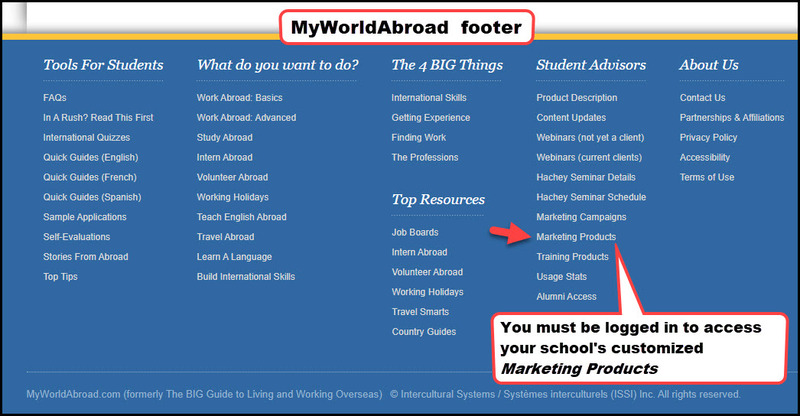 Marketing Products : MyWorldAbroad offers marketing products (view) that are specifically customized for each school: School posters (view sample print-poster or view sample electronic-posters) and promotional cards (view sample). TRAINING: Student Workshops and Individual Student Advising: MyWorldAbroad can be used for creating student workshops and for individual student advising. MyWorldAbroad training products: Quick Guides (view), International Quizzes (view), Self-Evaluation Questions (view) and "In A Rush?" Article Suggestions (view), Stories From Abroad (view), Sample Application Documents (view), Sample Resumes (view). WORKSHOPS: Your International Resume & LinkedIn Profile (view); International Skills? Be More Than Just A Tourist! (view); 100+ Ways To Maximize The Career Value Of Your Time Abroad (view). Applicable training areas: pre-departure and re-entry orientation, international job-hunting, and each of our eight go abroad experiences (view). A few schools have designed credit-based courses entirely around our Web site. MyWorldAbroad is trusted resource supported by a wide cross section of schools in US and Canada. Some of our longstanding client schools such as the University of Michigan and McGill University have been encouraging their students to go international for decades while others are just starting to encourage students to think international. We are there to help you in any circumstance. See our client list. Students are graduating into a working world where cross-cultural skills are essential and a global mindset is priceless. 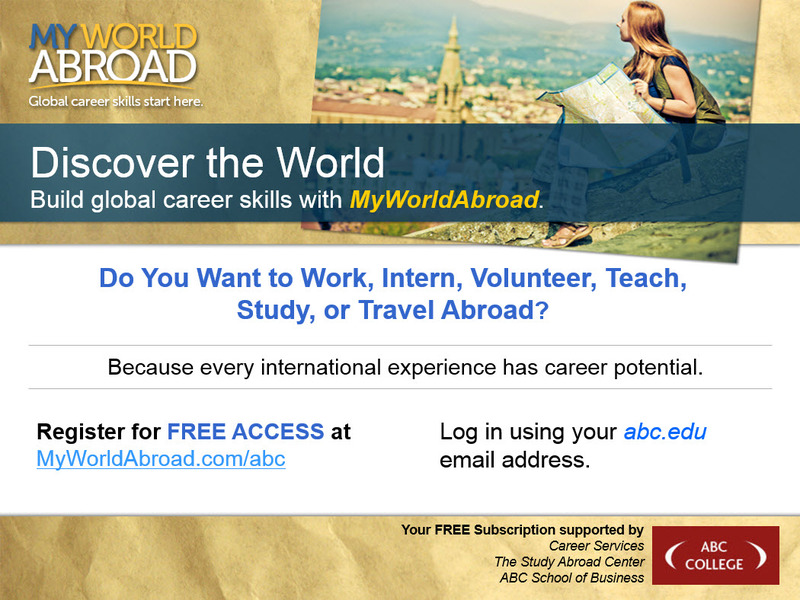 MyWorldAbroad helps you give your graduates a strong start in the new global economy. We promote international skill-building, cross-cultural travel, global awareness and an entrepreneurial approach to building careers. We look forward to partnering with you! We welcome your inquiries and/or consider attending one of our free demonstration webinars. COUNTRY-SPECIFIC JOB SEARCHING? Our competitors’ approach is based on a country-specific job search for finding international jobs. These services can be helpful to foreign students at your school who are looking for jobs in their home country, but the value to US/Canadian students is less clear; the main issue being the difficulty of securing a visa for professional work abroad with a foreign company. A country-specific job search only works for low-skilled work (volunteer, intern or working vacation placements), since it is much easier for US/Can. students to secure a working-vacation level visa for such temporary positions. A country-specific job search does not work for professional international work since students generally cannot secure the necessary working visa (for professional work) with local employers abroad. WHO HIRES US/Canadian GRADUATES FOR INTERNATIONAL WORK? The facts are clear: approximately 85% of young professionals working in international jobs are hired by US/Can. firms, US/Can. NGOs or the US/Can. Government. It is these employers who send recent graduates to work abroad, or to be based in the US/Can. while working on international files and projects. There is an especially huge demand and solid growth prospects for international jobs that are based in the US/Can. With the power of the Internet, the ability to put together international work teams and the ease and low cost of international travel, US/Can. firms (small, mid-sized and large firms) are entering the global economy faster than ever, and they need a pool of qualified student-graduates to compete globally. To effectively search for this type of US/Can-international job, students need to undertake an industry-based job search with US/Can. employers (rather than a country-specific job search with local employers abroad). By doing this they are increasing their chances of success, and building towards a truly sustainable international career. SUPPORTING THE GLOBAL COMPETITIVENESS OF THE US/Canadian ECONOMY: At MyWorldAbroad, we help US/Can. schools graduate a pool of globally-experienced graduates to help build the global competiveness of US/Can. firms, NGOs and the US/Can. Government.